After writing 22 of these Tip Sheets quite some time ago, and taking a break from tip sheet writing for awhile, I am now writing them again - occasionally, as topics crop up and ought to be communicated. And using an updated style and approach, so that this Tip Sheet replaces Tip Sheet #12. You can search for specific topics in these Tip Sheets, and other BullCharts information, in my BullCharts KnowledgeBase (in the Share Market Toolbox). This Tip Sheet talks about the layout of multiple price charts in the BullCharts window (a Workspace), and whether BullCharts might remember your last layout the next time you start BullCharts. Workspace? - what is it? Like many computer programs, BullCharts includes a number of "preferences" for how the program works. 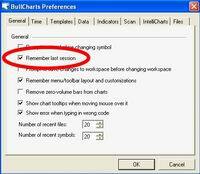 There is one in particular that determines whether BullCharts should "remember the last session". That is, if you close BullCharts with several price charts open (eg. of specific stocks and time periods) then BullCharts can remember all this, and open them all again the next time you start BullCharts. Tools > Preferences > (General tab), as shown in the accompanying screen shot (click on the image for a larger version). Workspace - what is it? Let's say you are running BullCharts, and you have three price charts open. You might be a day trader who trades Index CFDs, and you are looking at a 1-minute chart of the XJO index (ie. the S&P/ASX 200), and an hourly chart, and a daily chart. Or you might be a longer term trader/investor, and viewing a daily, a weekly and a monthly chart for a specific stock. This might look something like the tiny sample screen shot shown here. Click on the picture for a larger version. While we are looking at that chart, if you are interested in the detail, you might notice that there are various lines and text items on each of the three charts. In this situation I have turned the IntelliCharts feature on, and I have ticked the option to "Save different IntelliCharts for each time period". There are more details about IntelliCharts in the Tip Sheet #2 (see the Tip Sheet archive), and also in my eBook (PDF) Article number BC-06-100, "IntelliCharts" (Toolbox Members can see BC-06-100, non-members can see it listed here). Now, exactly what is a Workspace? It is the information that describes the way the BullCharts screen looks, and which price charts are displayed. In the sample here, it is the three price charts, laid out the way they are, including the displayed security and the details on the charts. All of the information that describes this is stored in a text file on your local computer. You can "save" the current screen layout as a new Workspace. 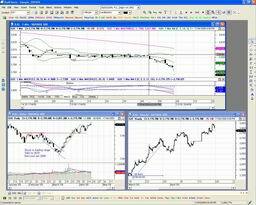 Then if you want to view the exact same combination of charts again at some future time, simply Open the Workspace. You can have multiple Workspaces saved, and since BullCharts version 3.8 there is a special Workspace Manager tool to manage the saved Workspaces. Each BullCharts Workspace that you save is stored as a separate file on your computer's disk drive. Each time you "Save Workspace", you create a new disk file, and you have to give that Workspace a name, which becomes the name of the disk file. You can use "My Computer" (Windows Explorer) to navigate to these files and delete or copy them. You can even attach them to an email message and email them to someone else (the same applies to your scans, and custom indicators). Also, with a Workspace open, it is easy to quickly close all the price charts, using the "Files > Close Workspace" menu option. Even without actually saving the workspace, if you have one or more price charts displayed, then this is actually a Workspace whether you have saved it or not, and you can close all price charts using the "Close Workspace" menu option. Once you have multiple charts open, the Workspace Toolbar becomes active (see the screen shot above). A detailed description of the three toolbar buttons won't fit in this Tip Sheet. From BullCharts version 3.8.x there is now a Workspace Manager included to help you manage your Workspaces. It is included in the "Control Panel" (or "Security Manager") function - the window panel that is normally displayed at the right-hand side of the BullCharts window. You can display/hide this using the F8 function key, or the appropriate Tools menu options. If you undock the panel from the edge of the BullCharts screen and let it float, you can resize it to look something like in the sample screen shot here. See a list of the saved Workspaces. Open a Workspace from the displayed list. 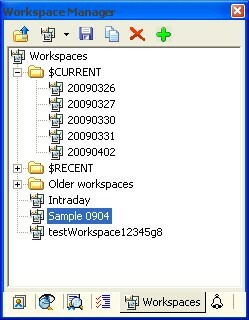 Create a new Folder to help group similar Workspaces together (as in the sample screen shot here). You can also easily: add a new one, delete one, and copy one. More information about how to use the Workspace Manager is included in my eBook (PDF) Article BC-09-400, "Workspaces". These occasional BullCharts Tip Sheets are intended to be short, quick grabs of information. There is more detailed information within my eBook (PDF) Articles in the Toolbox - some of which are available for free, but most of which are reserved for Toolbox Members (I can't afford to spend lots of time preparing quality information for free). Note: Any screen shots shown in this Tip Sheet are from BullCharts version 3.9. FEEDBACK? - I am very keen to receive feedback about these BullCharts Tip Sheets. Please feel free to email me with comments, or suggestions. Contact details are included below.